St Ita’s National School, Loughrea, are overall winners of the 2018 Schools Debating competition. The team from St Ita’s proposed the motion that “social media has fast become anti-social” and were vigorous in their arguments. They were challenged by runners-up Lisheenkyle National School from Oranmore, who put up an impressive defence of their arguments throughout the debate. This debate was the culmination of weeks of debating by the 18 schools from across Galway city and county who participated in this year’s programme. Teams from Connemara to Loughrea faced each other throughout the heats, quarter finals, and semi-finals, before St Ita’s were crowned champions and secured the Sr. DeLourdes Fahy Trophy. 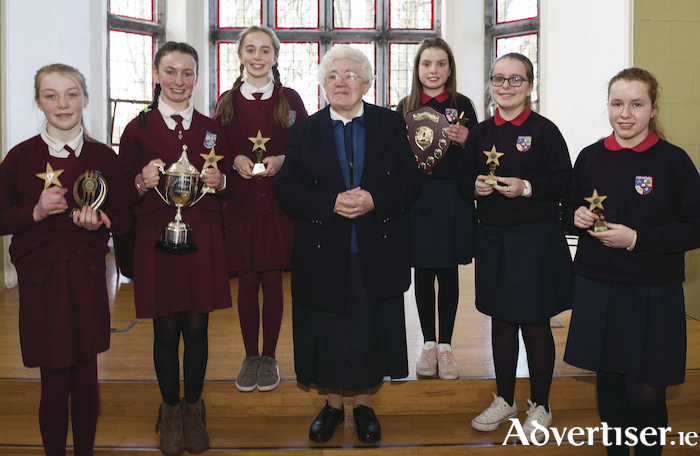 The competition is organised each year by the Galway Education Centre and co-ordinated by Margaret Martin, who thanked all those who participated for their enthusiasm and dedication throughout the weeks of the competition. Page generated in 0.1942 seconds.